Today you are going to learn how to make a cardboard flute that can really play. Playing it is harder than making it but you will soon get the hang of it and be delighted when you hear the notes. So let`s begin! We start with a plain old kitchen roll cardboard tube, or if you can get the inside tube from cling film, that`s even better. They have thicker cardboard and are a slimmer tube. But a kitchen roll will do just fine if you can`t. Get yourself a 12 inch ruler or a measuring tape and make some marks for the wind way and the finger holes. 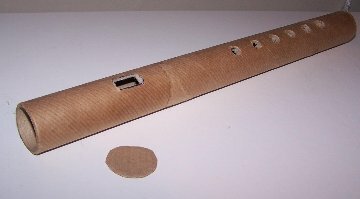 Instructions on How to Make a Flute. Measure 5 1/2 cm from the end and mark. Continue the line another 1 1/2 cm and mark again. Between these two marks is where the wind-way will be cut out. Continue along the line another 8 cm and mark, then 7mm and mark again this 7mm is the area where you will cut the first finger hole. From there measure 1 1/2 cm between each 7mm space for the other 5 holes. You should have 6 spaces all 7mm wide. The wind-way is not a round hole but an oblong one, so measure its width 8mm. When you have finished measuring, punch the holes with pointed scissors and twist until they are the size of the 7mm spaces. Cutting out the wind-way is a bit trickier. If the cardboard is thick you will need a craft knife and the help of an adult to do it for you. Cut a stopper to block of the end near the wind-way. 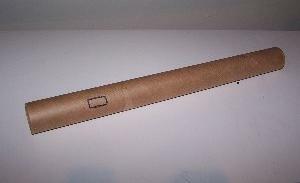 You do this by placing the end on the tube on a piece of cardboard and draw around it. Cut it a little smaller by cutting around the inside of the circle. 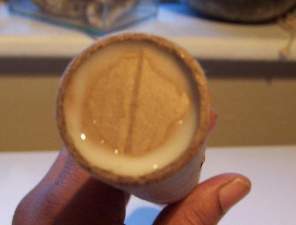 Place it inside the end of the tube and put some PVA glue around the edge to seal it and leave to dry thoroughly. How will you decorate your flute? Look what I have used. If you have visited my page on party hats you will have seen that my hats were decorated with polka dots, and I did say you should keep your scraps of paper for other projects. Well, the scraps from those polka dots came in very useful and made a nice jazzy design for my flute which I decoupaged. I had fun doing it too. Now how to make a flute play is up to you. Once you have decorated it, and of course when it dries if you have decoupaged it like I did, place the area below your bottom lip just under the windway or slightly over it and gently blow. Don`t give up if you don`t get a peep out of it, just keep practicing until it makes a sound. It will if you practice! The number of homemade musical instruments are growing. We will soon have enough for a band. So get busy!